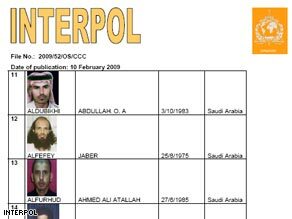 Interpol has issued a rare global security alert for 85 suspected al Qaeda-linked terrorists wanted by Saudi Arabia. The “orange alert,” issued on Tuesday, comes after Saudi Arabia asked for Interpol’s help last week in apprehending the 83 Saudis and two Yemenis. Interpol Secretary General Ronald Noble said the alert is unprecedented. “Never before has Interpol been asked to alert the world about so many dangerous fugitives at one time,” Noble said in a news release. He also pointed out that the alert comes ahead of the 16th anniversary of the first World Trade Center bombing in New York. “Therefore must be especially vigilant of fugitive al Qaeda terrorists,” Noble said. Six people were killed and more than 1,000 injured on February 26, 1993, when a 1,200-pound (540 kilogram) bomb exploded in a rented van in the parking garage below Two World Trade Center. The 85 wanted “terrorists” are suspected of plotting attacks against Saudi Arabia, Interpol said. It is rare for the kingdom to announce that some of its most wanted terrorists are on the loose. It is also unusual for Saudi Arabia to ask for help in finding them. By asking for Interpol’s help, Saudi Arabia is sending a clear message that it thinks the men are dangerous. The country has taken great strides to crack down on al Qaeda within its borders, touting the fact that the suspects have fled beyond its borders as proof that operations against them are successful. In some cases, terror suspects wanted by Saudi Arabia have fled to the neighboring country of Yemen because they can hide out there more safely than Saudi Arabia, a source explained. Interpol is an international police organization aimed at facilitating cross-border police cooperation. It is headquartered in Lyon, France.